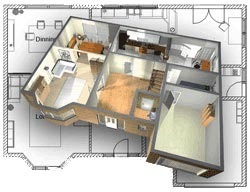 House design software or computer aided design (CAD) can be a useful tool whether you are taking on part of your home design or just want to use it to play with ideas before talking to a professional. Programs range from free online 3D modelling tools to expensive professional computer aided design packages. If you are looking for something to start playing with layout and design ideas then have a look at Sketchup. It’s the free version of SketchUp Pro and is a great tool for basic 3D modeling. Just go to the website, download it and away you go. There’s handy tutorial videos to quickly help you learn your way around the features and loads more on Youtube for specific bits and pieces. At the other end of the spectrum you’ll find computer aided design packages such as the well renowned AutoCAD by Autodesk. Their packages are generally better suited to professional designers who’ll benefit from the considerable investment rather than the average self builder/designer. Having said that, they do have a free web and mobile app called AutoCAD 360 which can be used to create, veiw and edit drawings. They also offer free trial periods for their premium design products. If you don’t have CAD experience, some additional training or a significant dedication of time might be needed to get the best out of it. Somewhere in the middle we find packages that are tailor made for house design and which also provide a more user-friendly experience. Visual Building (www.visualbuilding.co.uk) was launched by the man who introducted the Arcon range of self build products to the UK market. It is available for download from their website and is aimed at self builders and construction professionals alike. At the time of writing, Visual Building Ltd offer a free, downloadable, trial version and the website has a free training course and a growing range of tutorial videos to help you get the hang of it. Note: If you are searching online for house design software and you are a UK self builder, be aware that some of the packages are designed for the North American market and some of the house design styles and construction details can be different.